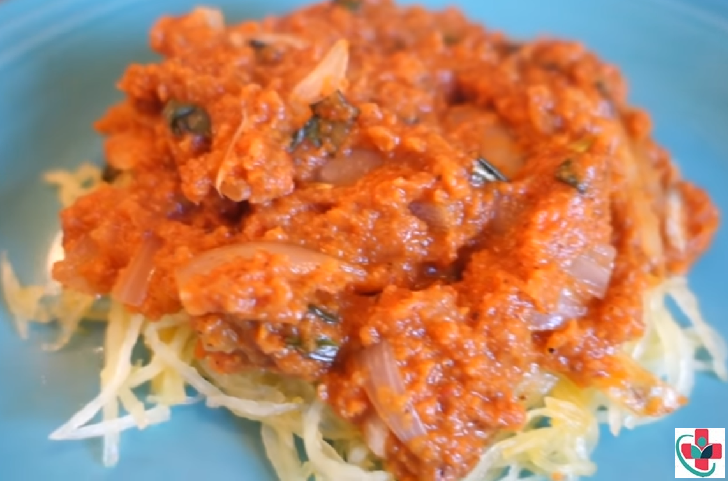 Cook spaghetti squash for a healthy addition to a low-fat diet. It’s mild flavor and hardy texture makes spaghetti squash ideal for a variety of recipes. Spaghetti squash makes an excellent side dish or a fun substitute in thin noodle recipes, from Asian to Italian. It is loaded with nutrients, such as beta carotene and fiber, and is tender, with just a slight crunch. ⏩Cut spaghetti squash in half, lengthwise (a good, sharp knife will be nice). Place each side, cut side down, in a shallow pan with about ¾ c water. Cook spaghetti squash uncovered for 45 minutes. Set aside to cool squash halves–enough to handle without causing death to the handler–but not completely cool. ⏩You have time to chop up all your ingredients while the squash cooks. For the artichoke, you may want to remove some of the outer, tougher leaves. ⏩For each half, use a spoon to scrape out and discard the seeds and dark center strings. Use a fork to scrape out the squash into ‘spaghetti-like’ strands. ⏩Add 1 Tbsp of olive juice and any other seasonings to taste. Serve warm. And a little-toasted bread on the side won’t hurt.